Adobo comes in different form and different technique. Each province in the Philippines has their own way of cooking adobo. There are chicken adobo, pork adobo or heart and lungs adobo of either chicken or any 4 legged animals. I would say that adobo is one of the fusion food in the Philippines. During my growing up years, funny because I technically thought adobo is only served during special occasions because I normally gotta taste it during christmas, new year celebrations and birthday celebrations. I just realized when I started working that adobo is an ordinary food served in many different forms depending on the household. Here's how you cook it. Combine all ingredients except for vinegar and water. 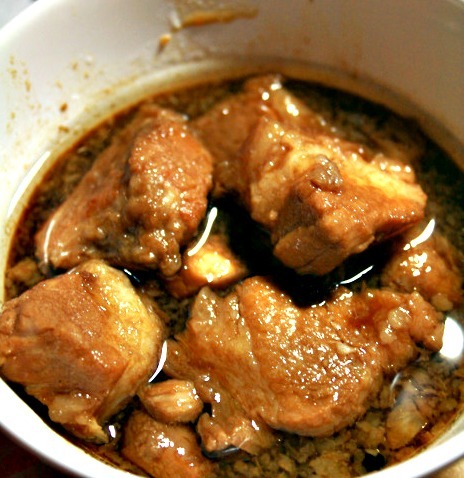 (pork, soy sauce, garlic, onion bulb, pepper, bay leaves, honey) and marinate it for at least one to two hour/s. In this way you are letting the pork absorb all the ingredients. Heat the pot and put the marinated pork. Add water then bring it to boil until the meat is fully cooked. Add vinegar and simmer for at least 10 minutes.